enVista’s inaugural supply chain and transportation executive summit is coming up next week! 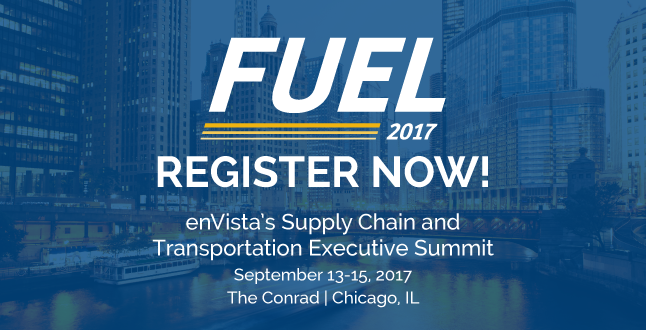 FUEL 2017, September 13-15 at the Conrad in Chicago, is designed to help transportation leaders connect with their peers in order to share ideas, shape best practices, and learn how to address some of the biggest challenges faced in today’s competitive and complex market. On September 13-15 in Chicago, Illinois dozens of transportation and supply chain executives will gather at our intimate educational conference designed to address your biggest transportation challenges. Join dozens of industry leaders and client presenters for dynamic keynote and breakout sessions, industry roundtables and interactive learning opportunities. Here are five sessions we’re most excited about! The CSCMP State of Logistics Report has tracked and measured all costs associated with moving freight through the U.S. supply chain since 1988. This year’s 28th report presents an overview of the economy during the past year, the logistics industry’s key trends, and the total U.S. logistics costs for 2016. CSCMP CEO Rick Blasgen will discuss the various supply chain trends that are shaping our future and how supply chain professionals might think about the effects on supply chains. Strategic sourcing is arguably the single biggest way to drive transportation savings to the bottom line. The implementation timeline is short, the impact is typically large, and comparatively, little operational change management is typically required. In this session, you will hear parcel subject matter expert Mark Taylor interview Vera Bradley’s ‎Director of Global Transportation & Trade, Shannon Kohl, on how he approaches strategic sourcing and how he leverages quantitative analytics to achieve his goals. Do you have the proper tools in place to ensure that all freight costs are accounted for and allocated to the appropriate cost center? Have controls been implemented to enforce supplier and carrier performance? Every month organizations go through complex, disjointed and often manual processes to report an accurate freight accrual. Visibility to what has been paid, what is outstanding and what has not been invoiced yet is a common challenge. In this session, Troy Allen and Elton Poisler from Urban Outfitters will shed light on how finance and operations work together to drive compliance and increase the accuracy of their transportation financial reporting. Transportation visibility is achieved by consolidating data from a variety of sources, which may include a combination of carrier invoice data and extracts from OMS, TMS, WMS and ERP platforms. Implementing order match processes that consolidate data across these platforms and utilizing business intelligence (BI) solutions that help analyze consolidated transportation data enable business to maximize their decision-making capabilities. In this session, Groupon Sr. Supply Manager Karthik Rangan outlines Groupon’s use of an Enterprise Data Warehouse (EDW) as a BI platform to analyze audited, order-matched transportation data for effective, agile decision-making. Determining the right strategy for global audit and payment implementations requires a calculated plan with a proven methodology. No two organizations are alike; what works for some companies may not be the best approach for your company. Whether you opt to rollout in phases, implement all regions concurrently, or use a combination of the two approaches will have an impact on the timeline and project ROI. In this session, Keysight Technologies’ Tom Denzler and enVista’s Dominic McGough will outline the necessary steps to take to avoid pitfalls and for a successful project. That’s not all, there will be over a dozen other breakouts designed to help you meet your organization’s challenges head on. It’s not too late to register! Click here to FUEL your supply chain.